When her owner died and no one could adopt her, 11-year-old Norah was taken to PAWS Animal Shelter. She’s eager once again to live in a quiet household with no other animals. 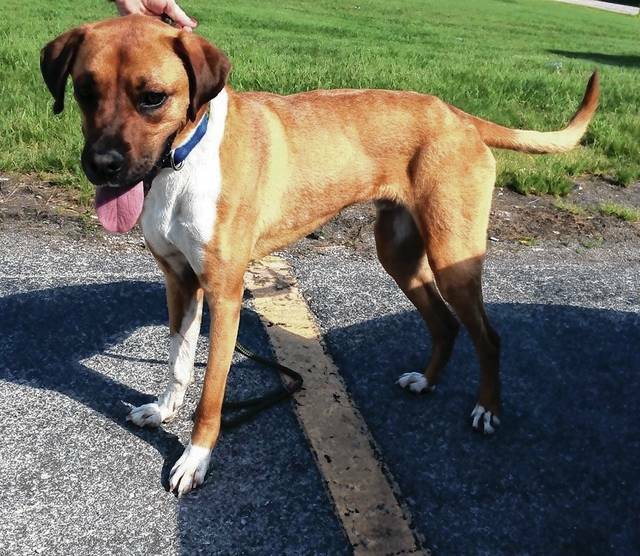 One-year-old Kamandor is active, loves to run and is waiting at PAWS Animal Shelter for an active two-legged pal. Ten-year-old Dagwood may lack teeth and good hearing, but is happy and likes dogs, cats and young and older adults. If you need an agreeable pal, pay him a visit at the Champaign County Animal Welfare League. Discovered running along a country road, puggle-mix Paul was taken to Barely Used Pets. He has fun playing with other dogs at the shelter, but really needs a person or family to take him to his new forever home. Please meet Norah. Norah’s life has been turned upside down. Her elder owner passed away and no one in the family wanted her, so PAWS took her in. She is an older cat around 11 years old. Norah has been thru so much these past few months. She is used to a quiet home with no other cats. Being in the shelter has been stressful for her. Please consider giving this sweet girl a new forever home. All she needs is a new someone to love. Norah is current on vaccinations and tested negative for Feline Leukemia and has been spayed. Please stop in and meet this sweet little lady. Such a handsome boy! This is Kamandor, a one-year-old Boxer/Great Dane mix. Kamandor was brought to us, here at PAWS, from a shelter where he was on the list to die within days. He is a big, active boy who loves to run and play. If you are looking for a running buddy, Kamandor may be your guy. Kamandor is good with most other dogs, after proper introduction, and has not been tested with the kitty’s yet. 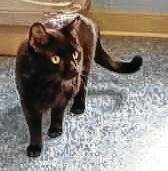 Kamandor is neutered and ready for his place in your home. Located on West U.S. Route 36, just west of Urbana, PAWS can be reached at 937-653-6233. 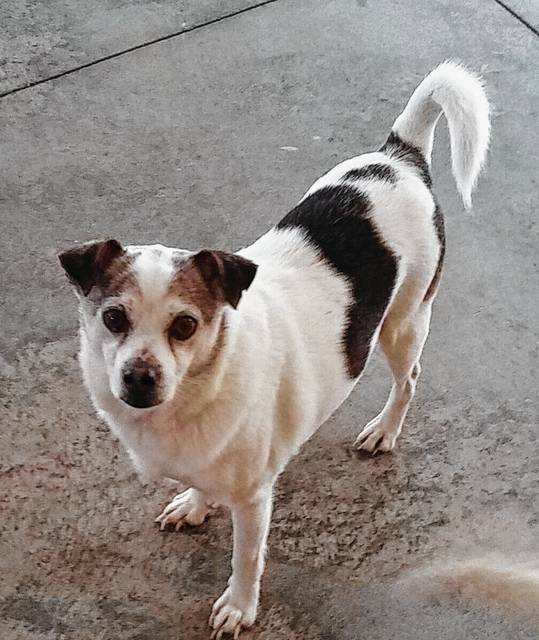 You are invited to visit our sweet senior Dagwood. 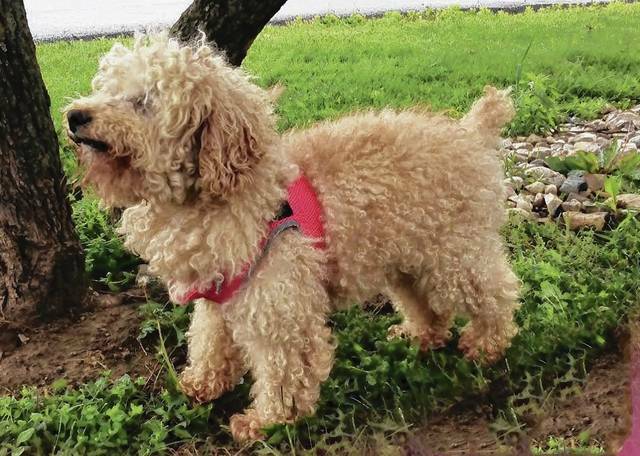 He is a 10-year old Amish puppy mill boy looking to spend his well-deserved later years in a loving home. Dagwood has a loss of hearing, but that doesn’t affect his happy attitude. When he came to us, all of his teeth had been removed and not properly. He is fine now, but he must be on soft food for the rest of his life. He is an apricot and crème Golden Doodle and weighs fifteen pounds. Dagwood doesn’t mind cats and gets along well with children and other dogs. He, as with all Champaign County Animal Welfare League pets, is neutered, heart worm tested, fully vaccinated, wormed, and treated with heart worm and flea prevention. Dagwood has also been micro-chipped and comes with his 2017 dog license. This gentle boy has spent most of his life in a puppy mill so he was never taught proper house-training skills. He would require a patient owner who has the time to make sure he is taken outside regularly. If you would like to see Dagwood or any of our other adoptable pets, please visit us at 3858 state Route 56, Mechanicsburg, OH 43044. You may also phone us at 937-834-5236. To view a listing of all our available pets, please visit petfinder.com and/or adoptapet.com. Also “like” us on Facebook to see our new residents when they arrive. We require an approved adoption application for all adoptions. You can fill out an application in house or download an application from our webpage at www.champaigncoanimalwelfareleague.com. Our adoption/donation is $150.00 check or cash. We always appreciate your donations of leashes, harnesses, laundry and hand soap, bleach and paper towels. Also, if you would like to volunteer, we would love to see you. Just stop in and fill out a volunteer application to become a part of this caring organization. We are open every day except Sunday and Tuesday. My name is Paul and I was found running around on South Elm Tree Road. I am a puggle mix boy and I’m about 4 years old. I am so glad that I am here instead of out there. What might look like a fun adventure out in the streets gets kind of frightening. I didn’t know where to go…where to run…where to find food…and where is my home? Nobody came to get me. I don’t understand what I did that nobody would be looking like crazy to find me to take me back home. But at least I’m safe and don’t have to worry about where to sleep and looking over my shoulder for bad guys! Well, lol…I look over my shoulder a lot here. Have you seen all of the fun kids in this joint? We get to go run on the playground every day and the people here are really nice to me. It’s a whole new world. I am so grateful that now I can start my new life, but what is missing is my new family. Please come and see me and help me to find happiness again. I promise to be the best boy you ever, ever had! I will listen to all of your stories if you promise to listen to mine. I have so much to tell you! Please make me part of your family. I don’t need much…just a little space to curl up next to you…or even at your feet. Oh yeah, and I really really need some lovin’…they say us little four legged ones are great therapy and company for people. Please let me be that for you. I promise to work hard to be a good boy…I just need a chance to be happy again. https://www.urbanacitizen.com/wp-content/uploads/sites/36/2017/06/web1_cat.jpgWhen her owner died and no one could adopt her, 11-year-old Norah was taken to PAWS Animal Shelter. She’s eager once again to live in a quiet household with no other animals. https://www.urbanacitizen.com/wp-content/uploads/sites/36/2017/06/web1_IMG_9568.jpgOne-year-old Kamandor is active, loves to run and is waiting at PAWS Animal Shelter for an active two-legged pal. https://www.urbanacitizen.com/wp-content/uploads/sites/36/2017/06/web1_dog-1.jpgTen-year-old Dagwood may lack teeth and good hearing, but is happy and likes dogs, cats and young and older adults. If you need an agreeable pal, pay him a visit at the Champaign County Animal Welfare League. https://www.urbanacitizen.com/wp-content/uploads/sites/36/2017/06/web1_21124.jpegDiscovered running along a country road, puggle-mix Paul was taken to Barely Used Pets. He has fun playing with other dogs at the shelter, but really needs a person or family to take him to his new forever home. Information provided by Champaign County shelters and rescues.